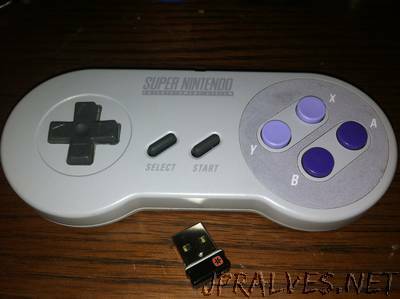 “The goal of this project was to build a wireless SNES controller that has the feel and action of the original hardware while also upgrading the interface from the SNES connector to a more modern USB connection. Instead of re-inventing the wireless wheel I started with a proven wireless keyboard and mouse technology. Using a single Logitech Unifying Nano Receiver it is possible to connect up to 6 devices using a single receiver. Once paired the device never needs to be synced again unless you wish to associate with a new receiver.